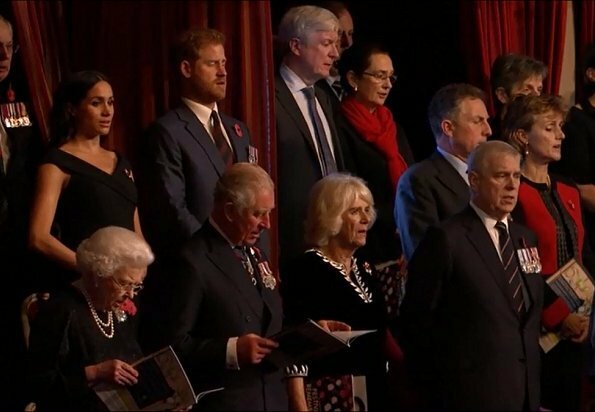 On November 10, The Royal British Legion hosted the annual Festival of Remembrance at the Royal Albert Hall to commemorate all those who have lost their lives in conflicts. 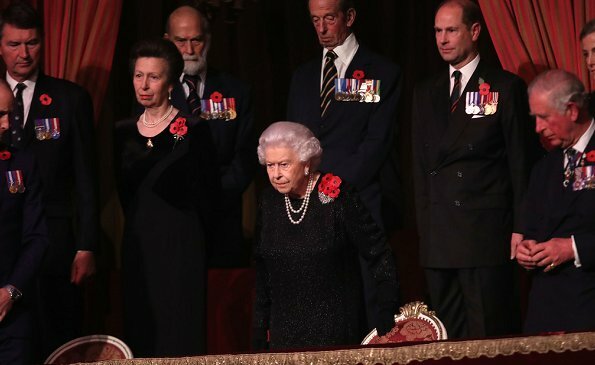 Queen Elizabeth and Members of the Royal family attended the annual Royal Festival of Remembrance at the Royal Albert Hall. 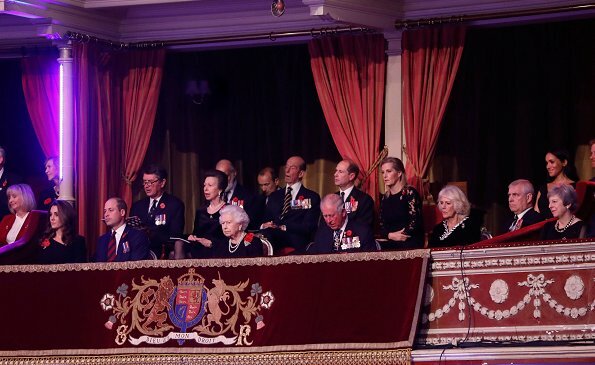 The Queen, The Prince of Wales and The Duchess of Cornwall, The Duke and Duchess of Cambridge, The Duke and Duchess of Sussex, The Duke of York, The Earl and Countess of Wessex, The Princess Royal and Vice Admiral Sir Tim Laurence, The Duke and Duchess of Gloucester, The Duke of Kent and Prince and Princess Michael of Kent attended the Festival. Kate and the Queen look amazing! Don't like M's coat and earrings, which are probably very expensive. Everyone looks good. Black is de rigueur for this event but they all look very elegant and the splash of the red poppies against the black looks good. I like Catherine's dress the best but I also like Meghan's and Camilla's. Agree totally, Catherine´s dress is the best and Meghans´s and Camilla´s are next. In my opinion I think the only ladies that look good are the Queen and Sophie. Kate has gotten so thin that it ages her 10 years and Meghan is wearing way too much makeup. The Queen outshines them all. Agree . Kate and Sophie are so beautiful as well. The Queen is stunning! I am crazy about Kates dress. I love the zipper detail on the back. Meghan's coat is beautiful, and perfect at this stage of pregnancy. I wish we could see her dress. I would also like to see William and Harry wear a dark grey or black suit to events like this, as opposed to blue. Sophie looks lovely, and I like her hair this way. It is so much more youthful. The Queen is my favourite too though the grey shawl/wrap is awful. Why?? I totally agree about the blue suits. All the other royal men are in dark navy or black as were most men in the audience. As well as the Queen's dress, I like those of all the other royal ladies. 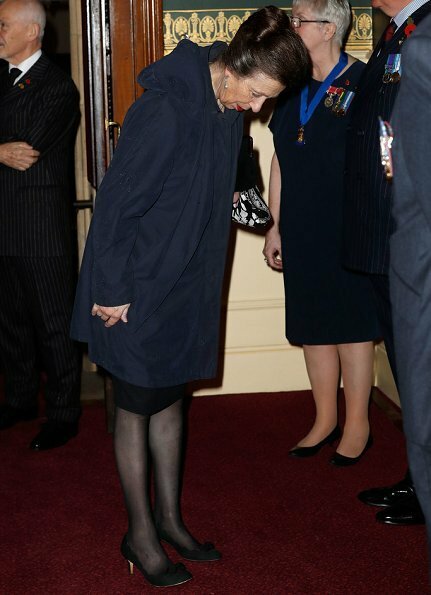 Possibly Princess Anne's is my favourite though you don't see a full picture of it--- looks simple and elegant. I don‘t like Kate‘s dress. Unfortunately we cannot see Meghans dress, her coat is very nice. Meghan spends far too much on clothing. It's all navy and black. I realize she is pregnant but can't she at least wear some of her coats more than once? Meghan's coat is not new. She has worn it before in Cardiff. Jane, if you look at the row of three pics near the end, you'll see Meghan wore this coat previously at one of her pre-wedding engagements. 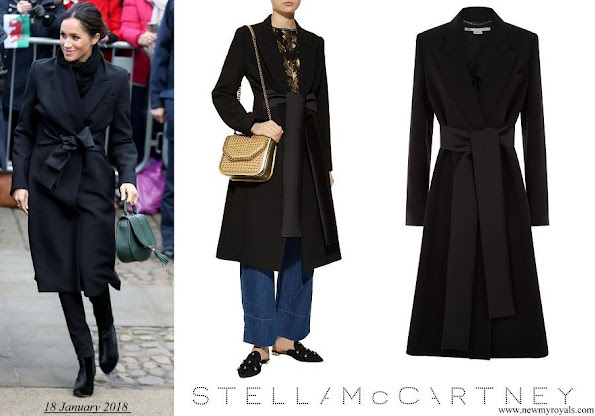 Jane, if you look at the row of three pics at the very end, you'll see Meghan wore this coat previously at one of her pre-wedding engagements. This coat is a repeat from before the wedding. She's been at this for less than a year and she already repeats plenty. You don't know what she pays so not sure how that is a relevant criticism. She has many designer friends so she most likely gets a deal on her clothes because she is getting them so much business. And she is rewarding the coat tonight. This is not new. She looks lovely!! 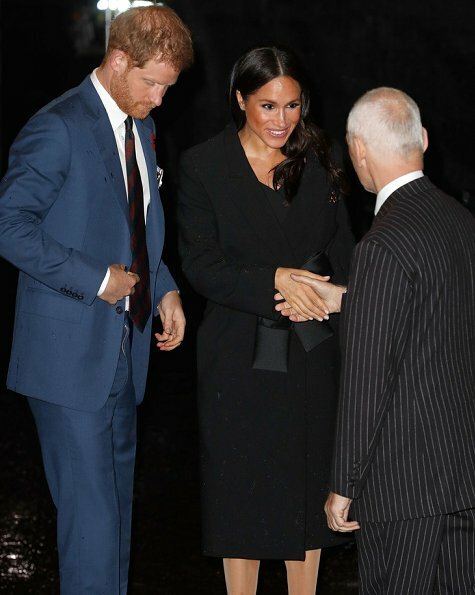 I agree that Meghan spends a massive amount on clothing but this coat IS a repeat. She wore it in Cardiff, I think, earlier this year. She also wore a ghastly beige trench coat more than once in Australia. When Kate entered the royal family, she needed an entire wardrobe as well. She never could have transitioned her previous wardrobe to royal life. The same goes for Meghan. It has been said here (incorrectly) that her clothes are too "Hollywood". Had she transitioned her former wardrobe into her royal life, you may actually have seen a taste of Hollywood some of you are so convinced you are seeing now. Diana went through the same thing. Senior royals have extensive wardrobes. The most "Hollywood" style inside royal family is Kate's hair style. Nothing wrong with it, but just to remind. A british newspaper has calculated that Meghan spend more money on clothes only for the Australia-trip than Catherine spends in a whole year. Anon 11:30 AM thank you for the hint about the hair style, so true and funny. I prefer Camilla's dress. Beautiful choice. I love the dedication to duty from the Royal Family,it is always spot on.Love Camillas dress Catherine looks great so is the Queen and the other Ladies. but they are not there to model fashions but to remember a horrible time in History. Thank you for every Soldier passed present and future. Very good comment. Agree with your sensitive perspective.Entire families and villages wiped out. Catherine's family lost 3 young brothers--Catherine's Great Uncles. It changed her family forever. 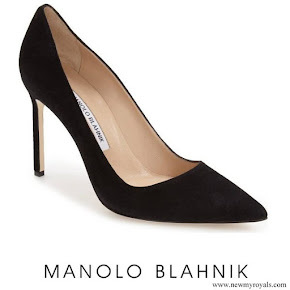 This is a fashion blog but the fashion in this case is tied to respect for terrible events. Anyway, I agree with "Jane" on this site. The Duchess of Cambridge looks very lovely but tired tonight. She is wearing a small one. It is slightly obscured by her hair in the photo of herself. She does wear a poppy, but most of these photos of her are with her coat on so it's not visible. Meghan is definitely wearing a poppy. Difficult but not impossible to see in these photos, it is very apparent in the videos. It is smaller and less bright than Kate’s, more like Camilla’s. As far as the amount of money spent on clothing, I believe most royals have always had a huge clothing bill. Nothing new there - it keeps the designers in business and people like us looking at them. Really? 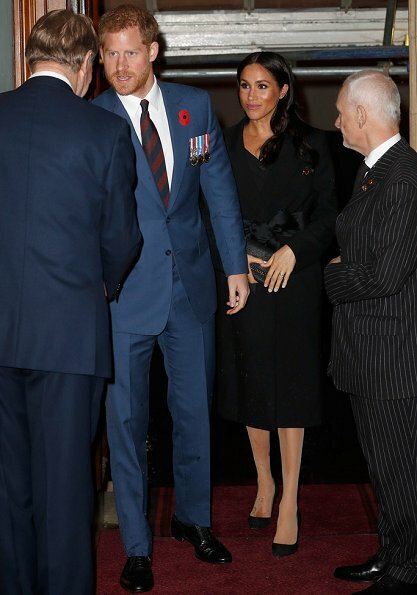 Meghan has a poppy pin on her coat. She probably has another on her dress since she removed her coat. It really seems like some people will look for any reason to criticize her. Kate does not look tired. This is a very solemn event. On another forum, someone suggested that William and Kate had been fighting. I guess everyone sees what they want to see. 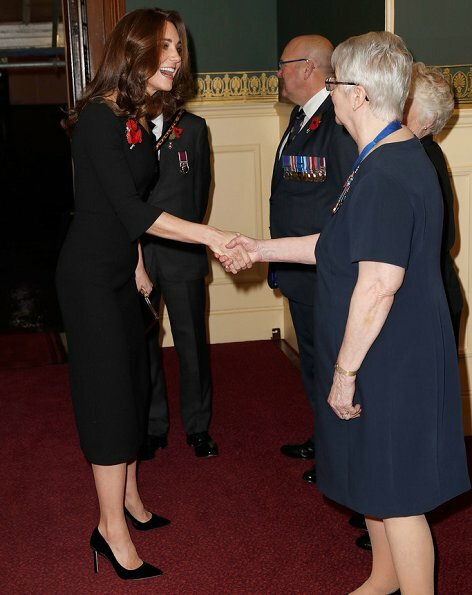 She's wearing a small poppy pin. 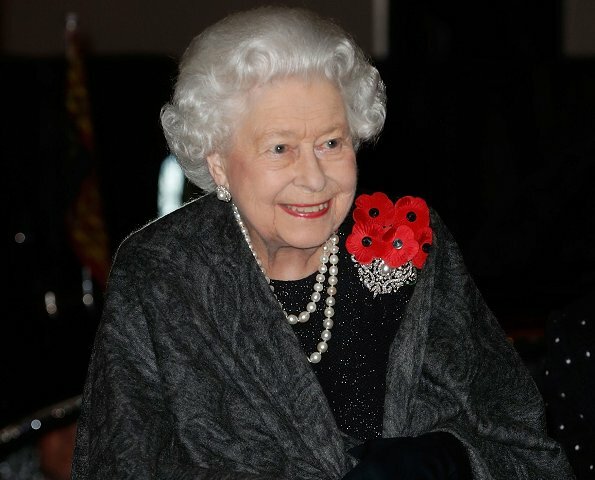 She actually is wearing a poppy brooch on her right lapel, rather low. If you look carefully you can see it, it’s rarher small. Sophies dress looks similar in style to the D&G dress CP Mary wore in Rome one evening a few days ago. Yes, except this one is too tight and too short for her. Meghan is radiant--what a beautiful complexion. Love the wide satin bow on her coat--elegant and perfect for pregnancy. Sophie's dress makes her look unfortunately wide (which she is not). The lighter lace cutouts on her arms draw attention to her widest outline instead of being the eye in and down in a streamline. Catherine looks lovely--luxurious hair. 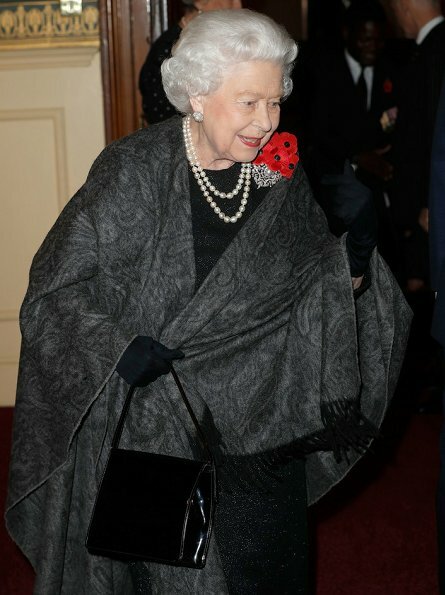 The Queen's scarf/shawl is quite elegant, love it. Catherine's dress is classic and fits her so nicely. Her hair is very pretty. Sophie looks great in the lace. I like her hair down, it does make her look younger. Cathrrine’s too dark eye shadow makes her look tired and old. I don’t know why she suddenly changed her makeup style but less looks younger and fresh in her case. The Queen looks magnificent! I actually think Catherine's makeup is great and very appropriate for an evening occasion. I do wish someone close to Meghan would encourage her to stop wearing such dark streaks of bronzer on her cheeks. It makes her look older and overdone. The Queen's scarf (shawl) is quite elegant. Catherine looks very classic. Her dress fits perfectly. Sophie's hairstyle makes her look younger and she is quite pretty in lace. D Kate looks amazing. I like Roland Mouret dress very much on her. I agree, she nailed this dress! 100 Punkte für die Queen, Catherine uns Sophie! Und 200 Punkte für Meghan und für alle anderen. Le prince Harry n’a t il pas un costume foncé. Il est le seul de la Famille en bleu clair ! Queen's shawl looks messy. Camilla's dress is unique and suits her. Kate's eyeliner makes her look tired but I like her dress. I don't think Sophie's dress is flattering her at all. Meghan has a nice coat. Anne's suit looks good but her hair really needs to be updated. The 1st point I want to support after having gone through comments is that the gentlemen should have worn grey or dark suits. Harry's blue is the worst, of course it might be an effect of the lighting. The queen's scarf (shawl) is lovely, I am so deligted to see her wearing something different from her usual coats. 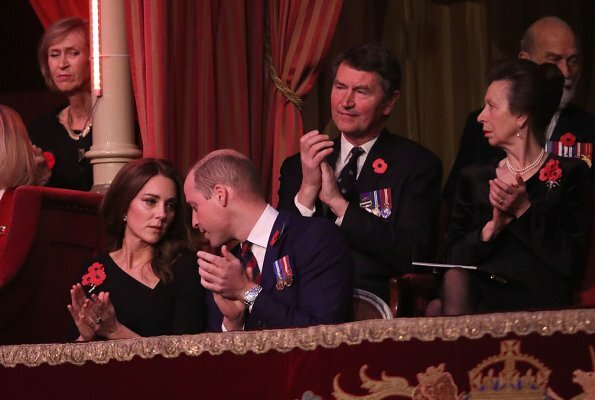 When the Royals sit together, like on this occasion, it looks unfortunate if someone stands out for some reason, especially if it is a solemn occasion. I wonder about the color of both Princes' suits, too. Even with the effect of photographer flashes they can't be dark navy, and it stands out in comparison. Same goes for Meghan's dress - all the ladies were dresses with long or 3/4 length sleeves, so her bare arms stand out. I dare say that there were sleeveless dress in the audience, and it would look perfectly well if she were alone and the focus of attention was just on her. However, when the Royal family participates as a unit, they have to bear in mind what will the big picture look like. This is not just being appropriately clothed personally. Just a thought on Meghan's dress...while pregnant, many women tend to get very hot. This may be the case with her. I wouldn't call her bare armed either. I would say she is wearing more of a capped sleeve. 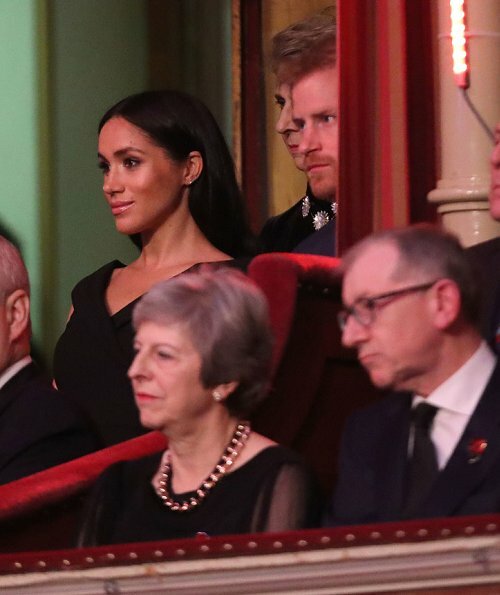 For what it's worth, I think Meghans dress was fine and perfectly appropriate for the occasion. She is one of the younger and lesser important Royals and therefore can have a little more leeway with her style and design. She wasn't out of protocol for a Royal theatrical event by any means. Her coat provided whatever arm cover-up she may have needed when necessary. She looked radiant as well. I‘m sorry but Meghan‘s dress has been the wrong choice. It looks like a cocktail dress. Catherine‘s dress is great and suitable for this occasion but as some have already written, she should change her makeup - or maybe just her work-life balance ;). I normally don't comment on the appropriateness of clothing but here I do agree that Meghan's choice was not the best. It's a rather solemn performance and the focus is on the dead, hence the black outfits. Her dress is more appropriate for a cocktail party and her bare arms do stand out. I am surprised that she's not getting better advice--or perhaps she's not following that advice. Her makeup needs adjusting so it doesn't glare. Kate's dress is gorgeous and her mystery earrings look very beautiful. I think Catherine needs to change her posture, not her makeup or weight or other things. She looks older than Meghan because her face is « falling », that is, she doesn’t have her tongue up on her palate to support her face. This is a new concept to most but googling Orthotropics, which was devised in the UK, would answer questions. Meghan has a beautiful face and profile because she keeps her tongue and mouth -indeed her entire body - in a good, healthy posture. I think the orthotropics concepts of mouth closed, tongue up, etc, are the secret, the fountain of youth! It sounds interesting and maybe it‘s a good method to relax facial muscles, Otherwise yoga is always a good way in addition or instead other workouts. Princess Anne is looking very good this evening. Actually she is between Kate and .. and Camilla and the Queen and Meghan (in the coat). While I like Catherine's dress, I have never been a fan of that side slanted v neck; it looks off balance. Love Meghan and Sophie's choices for an evening at the theatre. And Camilla simply needs a good make over and a personal trainer. It is not like she cannot afford it. The Queen looks lovely in black, as it flatters her white hair. I question why so many people complain about black; it is one of the most flattering and forgiving colors a lady can wear. 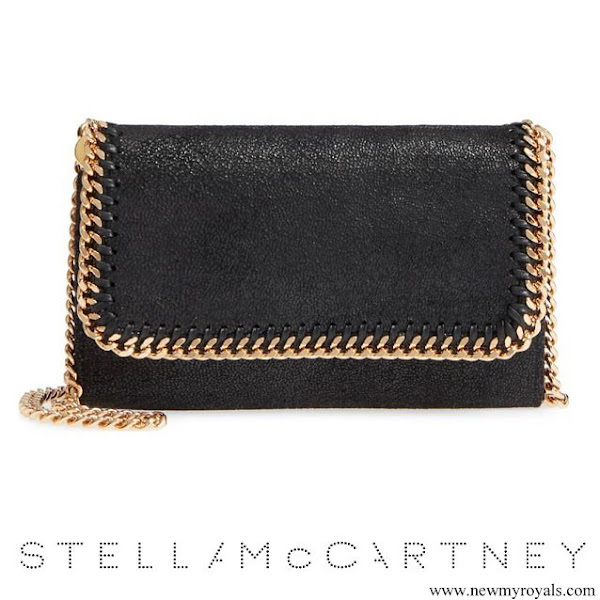 Blacks and various neutrals and tans should be a basis for every woman's wardrobe. Assessories can bring in color where called for. My first thought was Wow, the Queen is making an entrance! Though its more of the poppies are making an entrance and she is making a statement - we're here for them - those who served. The Queen looks stunning, I agree. 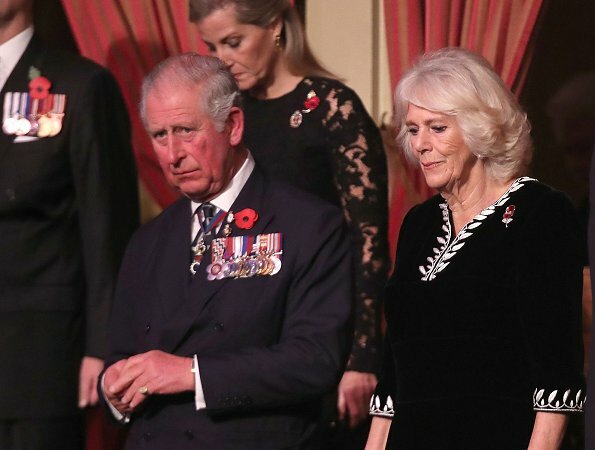 I am curious about Camilla's pin, it looks like it might resemble a thistle. All the ladies look great.